Sometimes we get error even at 99% and when we try to resume or refresh the address, the file starts downloading from the very beginning which is a total waste of efforts, time and data bandwidth. Today I am going to share a trick to resume download from the same point where u got an error. It will be beneficial mostly in the cases of downloading Youtube Videos and File Sharing Websites files. 1 1) Right Click on the error file and go to properties. 2 2) Click on the URL under the heading: “The web page from which this file was obtained” as shown with the tick mark below. The default browser will open this address from where you started the download. 3 3) From that link, start the download of the same file with the new address. 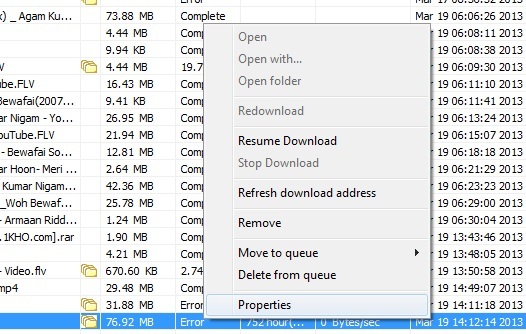 As soon as download starts, pause the download and go to its property of that file in IDM. 4 4) Copy the content under the tab “Address:” as shown in yellow in above picture and close the property box. 5 5) Open the error file and paste the copied address in the “Address:” tab by deleting the earlier one. 6 6) Now right click on the error file and press on resume and the file will start downloading from the same point(%). Thus you save your time and Bandwidth. Its mostly useful in cases where you download larger files say video from youtube and it fails with an error at Higher percentages say 50 or 60 or even 99%. If you face any problem, Do Comment.